This will take approximately 30 minutes. 1. In full sentences, explain why you decided to do the Professional Internship Program and what you want to gain out of this course? Please answer the below questions in the accompanying input box. e) It is 10am now. What time will it be in 3 hours? 3. Which one of these statements is true? Computer B is older and less expensive than computer A. Computer A is newer and less expensive than computer B. Computer B is newer and more expensive than computer A. Computer A is older and more expensive than computer B. 4. Show your filing skills A) Rearrange the below into numerical order. Copy and paste from the values above and paste from left to right. 5. There are spelling or grammar mistakes in each of the following sentences. Please rewrite each sentence with the mistakes corrected. i) Staff were told to be careful not to loose there building keys. ii) I had a good convasation with my supervisor. iii) I had to complete my prodject by Friday afternoon. v) Aparently we have a staff meeting at 1 o'clock today. vi) The stationary supplies in the office were running low. Beckett Primary School is located at grid reference D3 of this street map. Angela is driving south along Bruce St (reference A1). Which of these directions would lead Angela to Beckett Primary School? Please fill The blanks with 'Y' for YES or 'N' for NO. A) Go right into Kenny St, right into Power St, right into Allen St.
B) Go East into Kenny St, South into Power St, East into Allen St.
C) Go East into Kenny St, across Power St, South into Conway St, right into Allen St.
9. 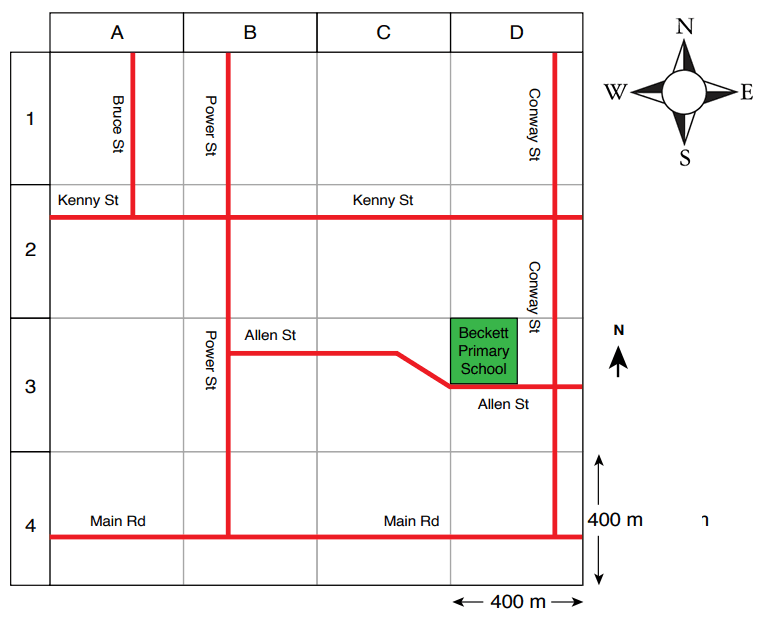 SCHOOL DIRECTIONS Beckett Primary School is located at grid reference D3 of this street map. The side-length of each grid square is 400 metres. Which of these values is closest to the area of Beckett Primary School in square metres? A secondary school offers one-year Vocational Education and Training (VET) courses. Courses may be taken at one of three levels: Certificate I, II or III. Students may enrol for only one certificate within each school year. This table compares the number of students enrolled in one of the courses with the number of students who completed a qualification in that course. 11. 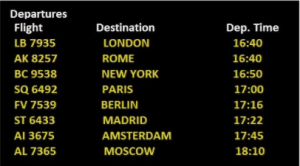 Below is a Departure timetable for flights to some major cities around the world. Which two flights depart at the same time? Thank you so much for helping us to carry the boxes in. We could not have done it without neighbours like you. Please let us take you out for a meal sometime. The teacher should have prepared for youre class. The teacher should of prepared for youre class. The teacher should of prepared for your class. The teacher should have prepared for your class. 13. Which sentence is grammatically correct? 14. 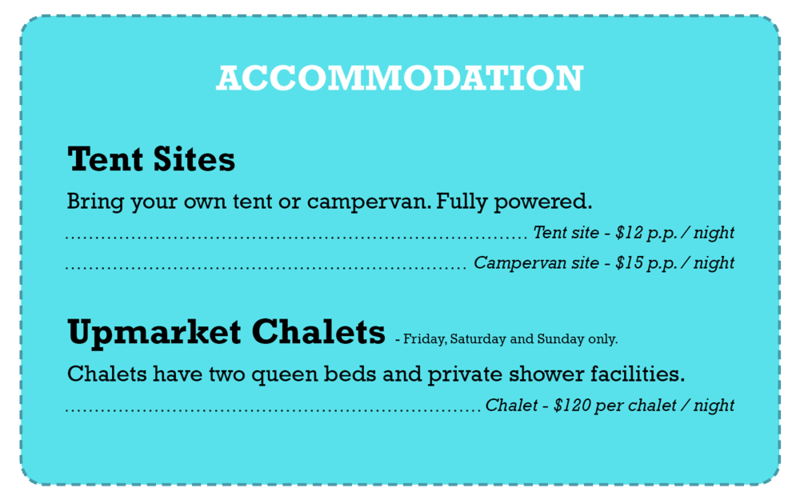 The advertisement below shows the cost of accommodation at a camping ground. 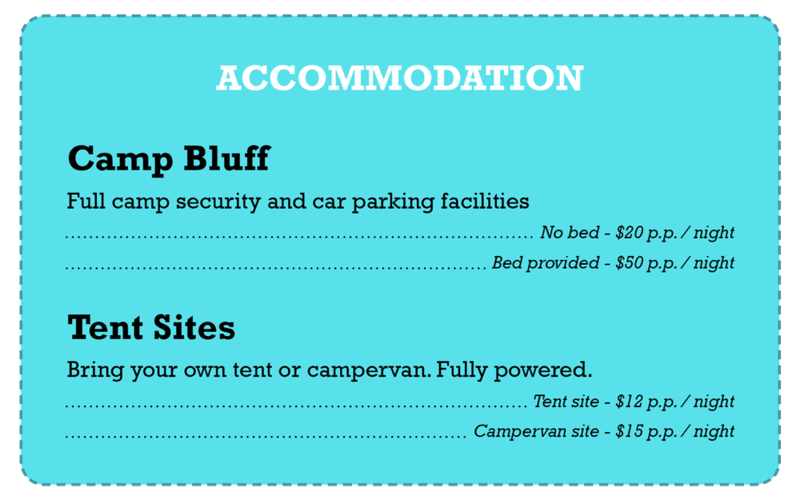 If campers take their own campervan to the tent site what is the cost per night per person? 15. 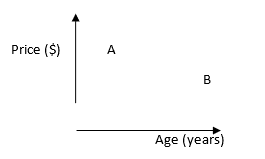 The text is similar to the one in the previous question, but this question is different. What type of beds do the chalets have? 16. What does this sentence need in order for the intention to be clear?My main hobbies are cycling swimming cooking cats and dogs. ‘I got my driver's licence when I was 17.’ He smiled at the memory, then a wince. ‘I remember, it was the school dance and I was so pleased because my father agreed to let me take his car. It was a 1951 Chevy Oldsmobile, complete with white wall tyres.’ He turned several pages of the photo album. then pointed: 'See, there? It was Dad’s pride and joy. I felt so little in such a monstrous car'. I hereby confirm that the answers provided in this assessment are my own work.